If you like fancy fashion fitted blazers and tuxedo jackets, Manzini brand fitted blazers are just for you. These unique style tuxedo jackets look like nothing else around with their attention to ever changing style. 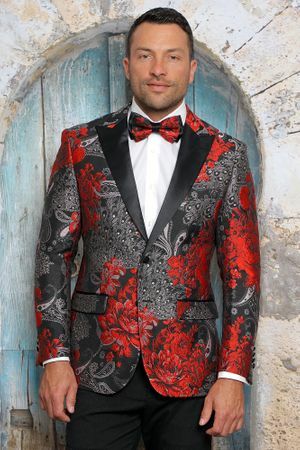 This fancy tuxedo jacket has a red floral pattern all made of woven microfiber that will just glimmer in the spotlight. Bow tie is included.